Shelby Lassiter Kincaid, the widowed heroine of Where She Belongs, dreams of raising her daughters in the golden place of her own childhood. Misty Willow, a farm nestled in the gentle slopes and valleys southwest of Columbus, Ohio, was first hewn out of the countryside by a Revolutionary War veteran in the 1790s. The Virginia Military District land grant set aside a huge swath of acreage to veterans who were willing to trade their muskets for hoes. Isaac Payton, Shelby’s direct ancestor, volunteered. According to family lore, Isaac’s wife Constance named the homestead. While Isaac built their cabin, the young couple camped near a willow tree overhanging the banks of Glade Creek. In the early mornings, as Constance greeted the sunrise, a haunting mist blanketed the land. Constance thought it mysterious though oddly comforting. Her heart always skipped a beat whenever her handsome husband emerged through the fog to join her. They sat on the bank, enveloped in the mist, and made plans for their future in this new country. During the Civil War, the willow standing sentinel over Glade Creek witnessed another important event in the family’s long history. Eliza Payton found an injured Rebel soldier near the creek and secretly nursed him back to health in the abandoned cabin. When Jeb Lassiter recovered, he asked Eliza to marry him and carved their initials on the willow’s trunk. Throughout the years that followed, engaged couples added their initials so that the willow became a living family tree. Shortly after Shelby and her girls settle into the brick home, built by Eliza’s father quite a distance from the creek, she takes them on a picnic to the “engagement tree.” Shelby points out her parents’ and grandparents’ initials but decides the girls have learned enough family history for the day when six-year-old Elizabeth asks about the SL + JO carving. Turns out, Shelby’s teenaged boyfriend was a bit premature with his marital plans. For reasons given in the story, Shelby’s husband never visited Misty Willow. But perhaps Shelby will be given another chance to have her initials joined on the tree with those of the man she loves. Misty Willow is a fictional farm inspired by a huge brick house where my family lived when I was a teen. Built in the mid-1800s, it was first known as Maple Lane and later as Twin Oaks. We still call it The Brick. A beloved house. Possible Underground Railroad activity. A secret room. These elements and more are woven into a story that explores how much our present is affected by the past. 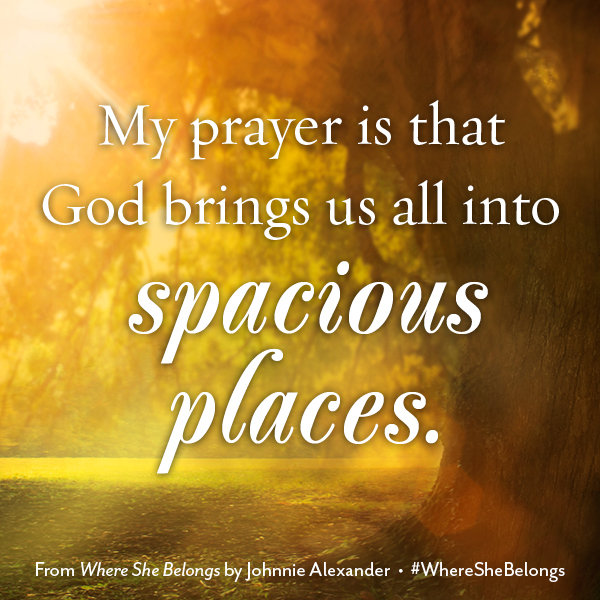 Johnnie Alexander writes inspiring stories that linger in the heart. 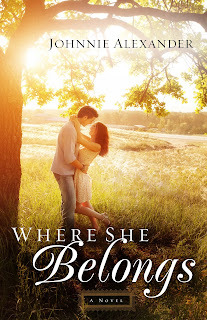 Where Treasure Hides, her debut novel, won the ACFW Genesis Contest (2011) and Golden Leaf Award (2014). 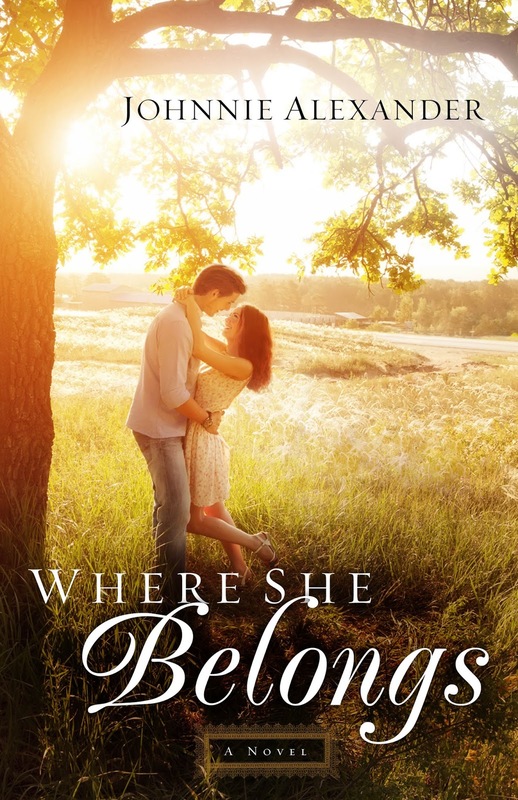 Where She Belongs (Misty Willow Series; Revell) is her first contemporary novel. Her first novella, The Healing Promise (Courageous Bride Collection; Barbour), releases in 2016. She also has won Best Novel and Best Writer awards (Florida Christian Writers Conferences), and Bronze Medalist (My Book Therapy Frasier Contest). 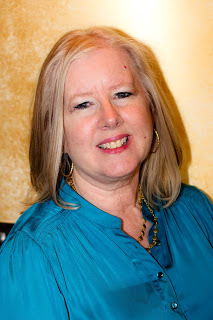 She volunteers as marketing director for the MidSouth Christian Writers Conference. Johnnie has generously offered a giveaway of her book, choice of print or ebook to any U.S. resident or an ebook to an international commenter. To enter, leave your email address in the following spam-free format so we can contact you: email AT address DOT com. Is there an old homeplace, real or fictional you'd love to visit? How about one you grew up on or have visited often? Tell us about it! Hi, Natalie. Thanks so much for having me as your guest. I love talking about the history behind Misty Willow--both the real and the imagined! Thanks so much for being here, Johnnie! I loved learning about the beautiful home you grew up in! My mother's father was raised in PA but never lived there as an adult. After he passed we had his remains taken back to his hometown in PA, and we all got to visit this tiny town where he grew up. It was neat to see a bit of my families history there. A very nondescript little town, but I grew up in a very small town too, so it was great to see. Love your books Johnnie. kamunden44ATyahooDOTcom. My old homeplace is now a doctor's office. I would go visit but I don't need a neurology doctor. Thanks so much, Kim. I appreciate that! Love your humor, Library Lady. I imagine the house looks very different as a doctor's office. I've never read your books, but oh, I love genealogy and history! 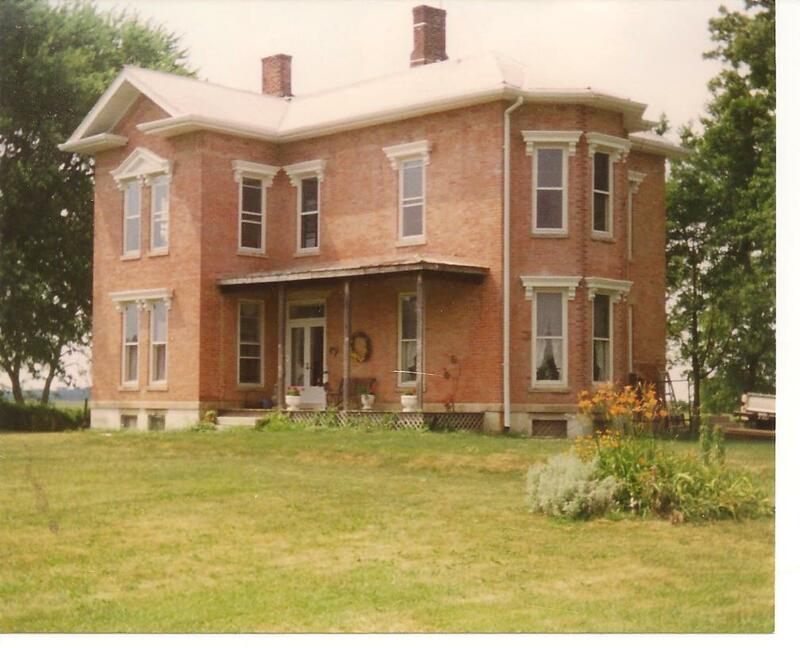 There are so many ancestral homes that I'd love to find, and they're all over the U.S. and in Europe too! There's a tiny village in Alsace called Hausgauen, and that's where one ancestral family originated. I'd love to go exploring there! Hi, Karen. Exploring ancestral homes in Europe would be such an adventure. My family has been in the U.S. since the late 1700s so I wouldn't even know where in Europe to look. So I'm also a little envious of people who know their ethnic heritage. Hope you get to take that trip! My dad's sister lived in the house they grew up in so we visited there many times. It had originally had a dog trot, but that had been closed in. There were fireplaces in every room and no indoor bathroom until I was about 10 when they did some remodeling. They kept part of it closed off because it was difficult to heat the entire house. When I was a girl, I was just sure that the closed off parts were haunted!! I would love to visit my ancestral family on my father's side in Nova Scotia. According to my dad, we still have family there and I sure would love to go there to meet them! I've always loved my family home, but somehow it's not the same now that we are all grown. In my mind, I'm probably romanticizing things, but I do long for those days past with all of us gathered together. I can't wait to read your book!!!! I know both my husband and I have family lines dating back to colonial times in America but one of my husband's ancestors is Daniel Boone's grandfather so we hope to visit some of his famous stomping grounds with our children. I'm looking forward to reading your book! Thanks for all the great giveaways, I've been chasing you all over everywhere, lol! I lived in Kentucky until I was 8 years old in a house my dad built. My sister and I took a trip there a few years ago and I wanted to see the house so bad but found it had burned down. That was so disappointing and almost traumatic. I am looking forward to reading this book. Thanks for the opportunity to win a copy. Wow, I have a lot of catching up to do. I love it! Melmanro, I don't blame you! I would have wanted it to be haunted even if it wasn't in that good-scary kind of way. LOL! Kate, it sounds like you have treasured memories in your family home. It's a little bittersweet for things to be different, isn't it? We have no connection now to any of the homes we lived in when I was a child, and I wish we did. I think that's why legacy and heritage are prominent themes in my stories. Beth, your "chasing" comment made me laugh. Out loud. Literally! How fun. And how cool that your husband is related to Daniel Boone's grandfather. I also blog at www.midwestalmanac.com and wrote a post not long ago about Squire Boone who lived and is buried in Indiana. (He's Daniel's not-as-famous brother.) So glad you shared! Oh, Stella! That hurts my heart. I'm so sorry about your childhood home. I'd have been upset, too. I drove by The Brick (which is how my family referred to the house that inspired the one in Where She Belongs) once by accident during the years it was abandoned. I parked at the end of the drive and grieved. It's been restored since then and I'm so glad. Thanks for sharing. I forgot to leave my email. Hi, PATTY! Thanks for sharing a piece of your family history. It’s always great to see what life was like for generations gone by. Hi, KIM! Thanks for coming by! Best wishes in the giveaway! JANET!! Good to see you again, lady! Haha. I love your sense of humor. Lately I’ve noticed a number of doctors’ offices taking up residence in a vacant home. Perhaps it’s to make the patients feel more comfortable. Hi, KAREN! Thanks for stopping by! Hausgauen sounds fascinating. I think venturing through Europe’s old home places is a terrific idea. Best wishes in the giveaway! Hey there, MELMANRO! Welcome to the Sweet South Blog! So great to have you here! I love old homes with a dog trot. How funny you thought your aunt’s house was haunted! Your comment totally made me smile. Hi, STEPHANIE! When I think Nova Scotia my little reader’s heart pictures Anne Shirley at Green Gables! What a fun trip to look forward to one day! TERRILL, your grandmother certainly sounds like a courageous woman. I bet the world she navigated and lived in day to day would be such an interesting contrast to the one we have now, reminding us what we have to be thankful for. And yet, in every decade, there are those little things that stay constant, like faith and family and the things that really matter. Thank you so much for sharing that! Hi, KATE! It’s great that you have those sweet memories with your family! Thanks for stopping by, and I wish you the best in the giveaway! Hi, BETH! Welcome to the Sweet South Blog! My family loves the old Daniel Boone TV series, and whenever we travel through “Boone” country we talk about stopping to visit the local historical sites. How fun! Thanks so much for coming by! Welcome to the Sweet South Blog, Stella! Wow, I can't imagine that experience. What a treasure to live in a home your father built, but then what a sad scene to find it gone. Thank you for sharing! Hi, Janet. That's not a part of history I know too much about though I may have had ancestors fighting in that war. That's one of those things I always meant to research but so far it hasn't happened. Hi, Donna. Where is your mom's home? I hope you get to visit there someday.